I was invited to participate again (yay!) in the Del Real Recipe Challenge (voting begins soon!). I racked my brain about what I wanted to create this year and after a little trip down to Mexico I got inspired by the tacos I ate in Tijuana. I decided to try and recreate the Quesataco I had in Mexico and topped it off with a delicious homemade sauce inspired by a trip to Vegas. 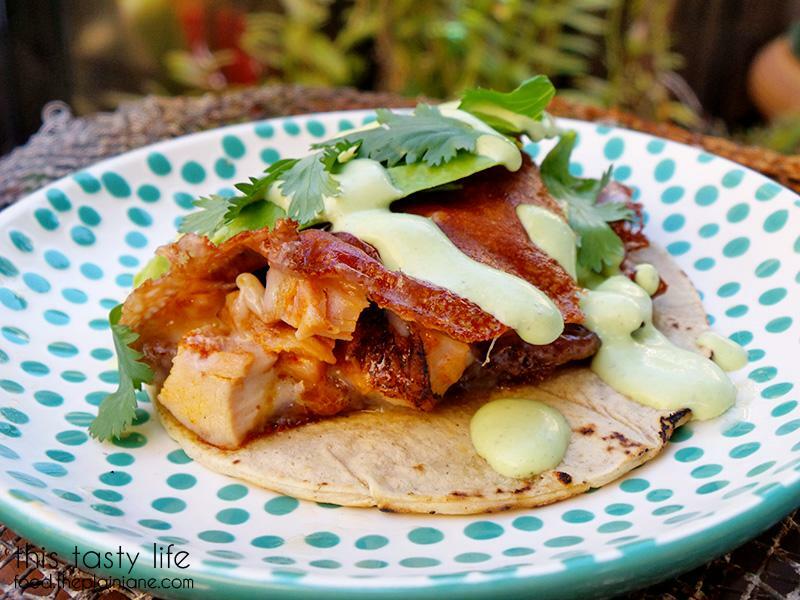 There’s a combination of travel experiences in this one recipe! There’s one item missing from this small list of ingredients and it’s not in the photo only because I didn’t intend to use it – and that’s sour cream. 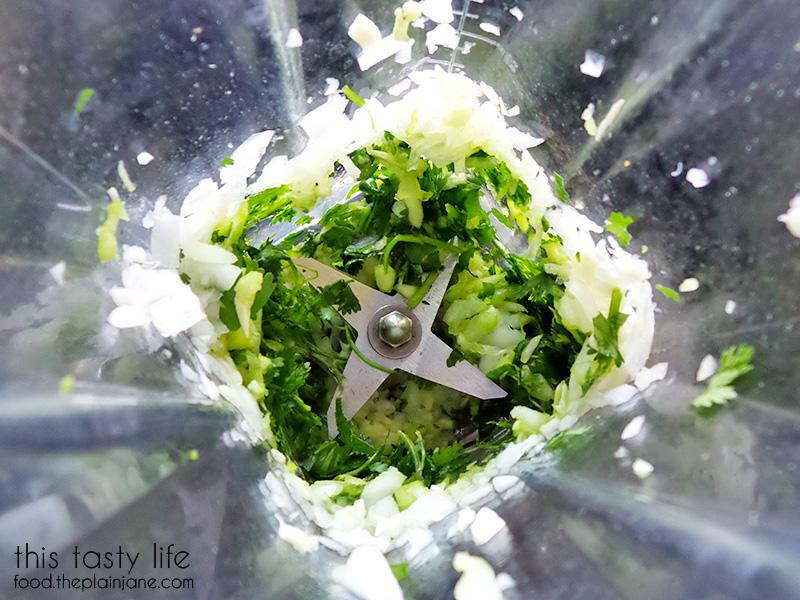 Let’s make the Cilantro Garlic Sauce first! This sauce is inspired by the delicious sauce we got in Las Vegas at a Venezuelan restaurant called Viva Las Arepas. It was an incredibly flavorful sauce that Jake and I put over just about everything we ate there. 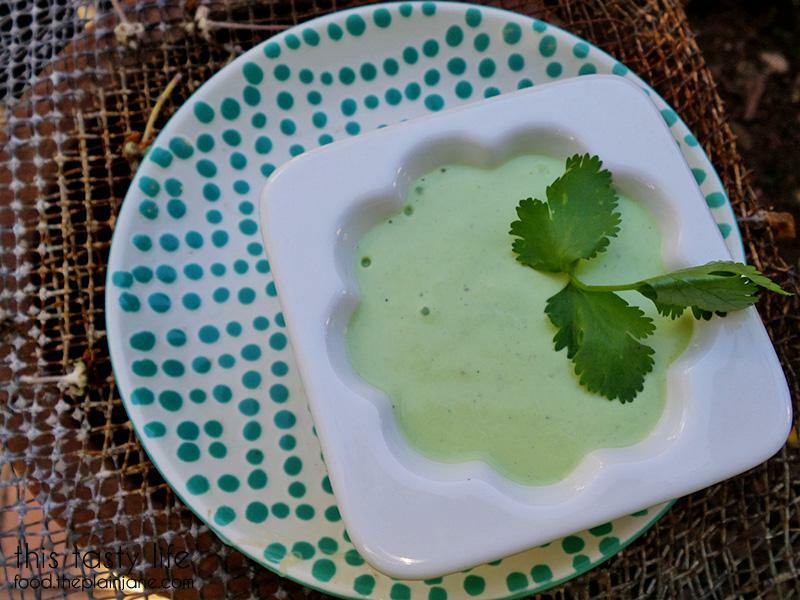 I looked up some recipes for it (even though the guy told me it was only mayo, garlic, and cilantro I still needed to know the amounts) and found one that I liked. All of this stuff just goes into the blender. First, add in half an onion and garlic cloves. I used four garlic cloves and I regretted it a tiny bit because the raw garlic made it a bit on the spicy side. This sauce packs a punch and if you don’t want to feel like you’re getting kicked in the teeth, I suggest knocking the garlic back to three (or even just two) cloves. Pulse those suckers together. Then add pretty much add half a bunch of cilantro leaves. Don’t be shy. It is called “cilantro” garlic sauce, after all. Then… add in mayo and salt and pepper. Blend until smooth. At this point I tasted it… but found it wasn’t quite what I wanted. And that’s when I decided to add the sour cream in. The sour cream made it a thinner sauce and evened out the flavor to me. I thought the mayo was too overpowering on it’s own but the sour cream mellows and chills it out. IT IS DELICIOUS. I put the cilantro garlic sauce into a squeeze bottle and kept it in the fridge. 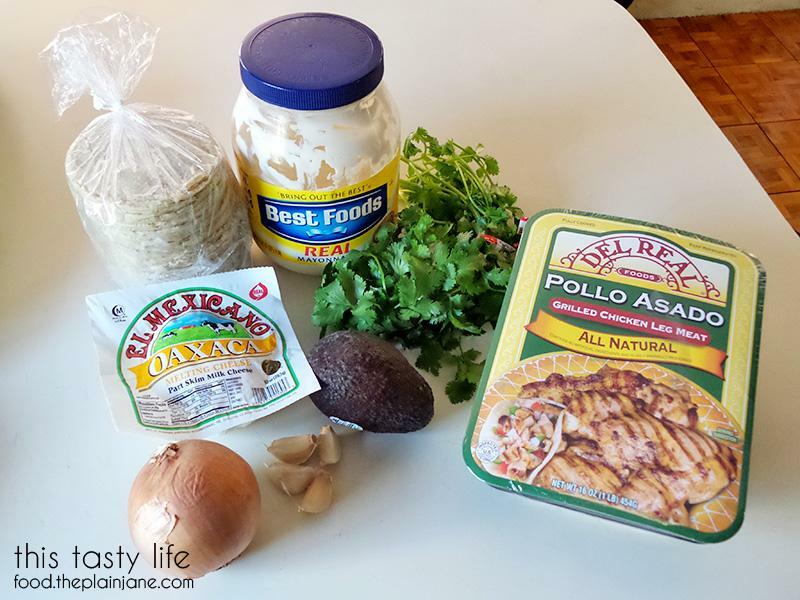 It makes quite a bit and it’ll last you for a little while so you can put it on EVERYTHING including these quesatacos. Now that the sauce is done… let’s prep the rest of this. It won’t take long. Shred your cheese. I used Oaxaca cheese but I think anything that melts well would work here. 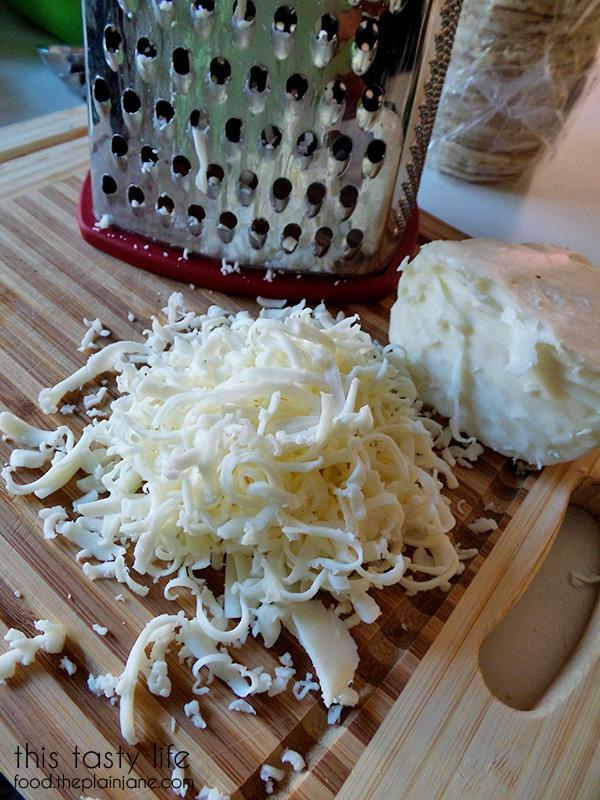 Shredding your own cheese takes a little bit of time but I think the cheese tastes better – it doesn’t have those weird chemicals in it that they put into bags of shredded cheese (to help prevent clumps). I’ll have my cheese without extra weird stuff, thank you. 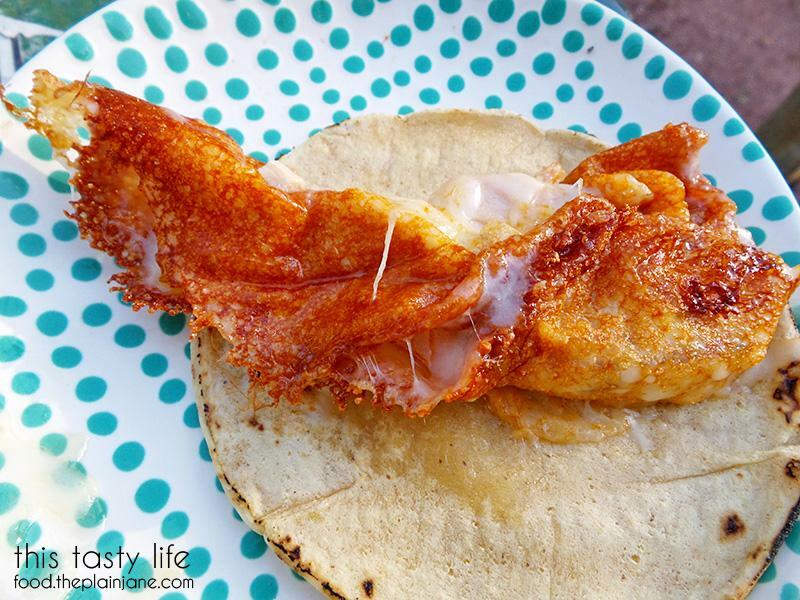 Del Real Pollo Asado. A real shortcut here. 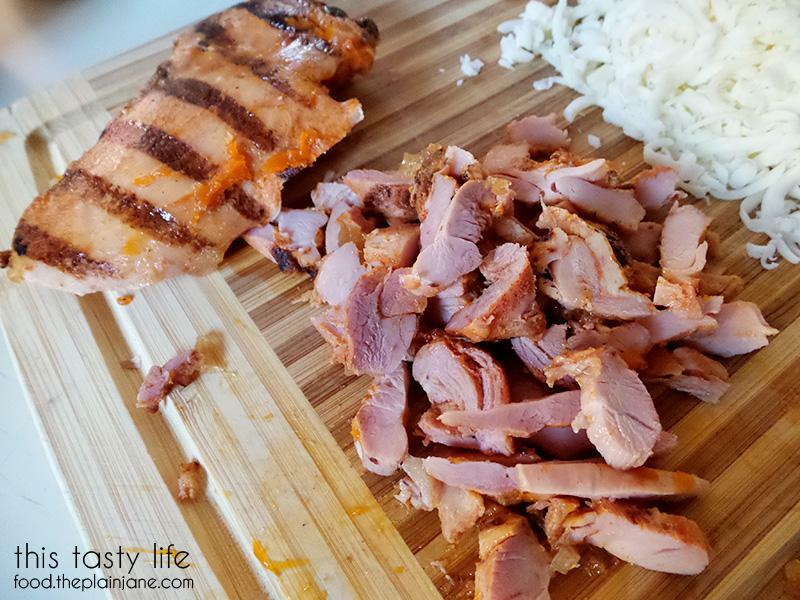 Open package and slice chicken. 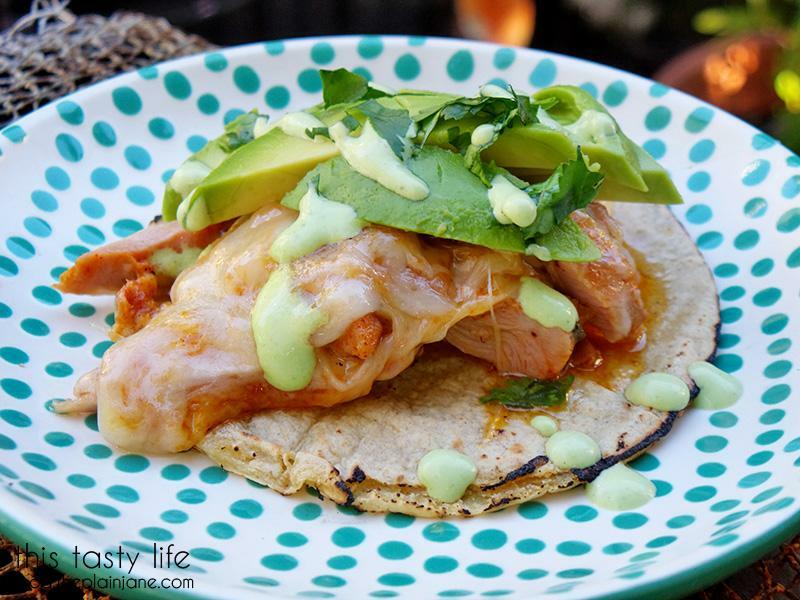 The pollo asado has a great flavor and tastes so good with the melted cheese! Then heat up some tortillas. I do it over the flame. It only takes a few seconds! Keep them warm in a kitchen towel. Pretty much at this point you’re just melting cheese and then adding chicken. But there are tricks to it! The first time I tried to make the cheesy crust for the quesataco it didn’t really get… crusty. See what I mean? Not crusty. Very cheesy. Very tasty. But not what I wanted. The next day I tried again. AND I MADE CHEESE CRUST! I mean… I made it ugly a few times until I got the hang of it but still – I did it!! The trick is to sit and let your pan (a non-stick pan) get quite hot. In fact, the first one you do will probably just be a melted mess until the next one. Keep the heat at medium high to high heat and just let the cheese melt and do it’s thing. Add the chicken pieces right on top and let it heat up with the melting cheese. Slowly you’ll start to see it form this golden crust on the edges. When the cheese is golden and set, take a spatula and flip it over like you’re folding over an omelette. This takes a few tries to get right, too. Sorry I don’t have a photo of that… it was too difficult to watch the cheese, flip it, and take a photo. 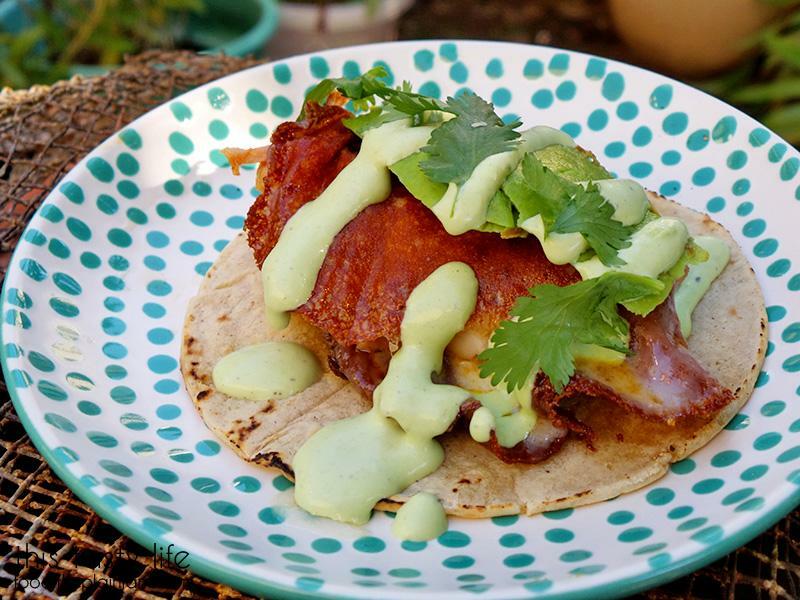 Plop your freshly created Quesataco onto a warm tortilla with slices of avocado, cilantro leaves, and a large drizzle of cilantro garlic sauce. Admire your handiwork and then DEVOUR. 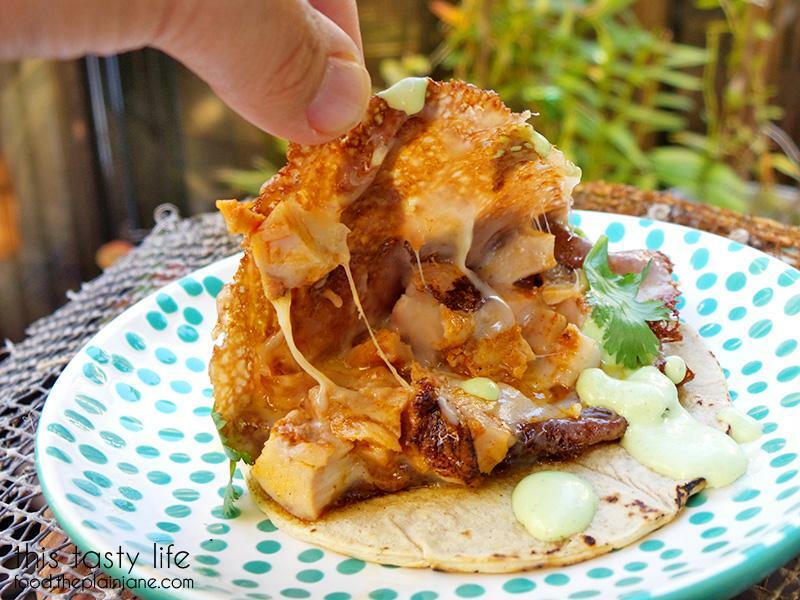 Even if your first tacos don’t have a golden crust – it’s okay! It’s still basically chicken covered in cheese! It’s still really tasty! Just consider them practice tacos that the chef has to munch on and then make more tacos. This photo is merely to demonstrate the gloriousness of cheese crust. ALL HAIL THE QUESATACO. Here’s the handy dandy recipe. 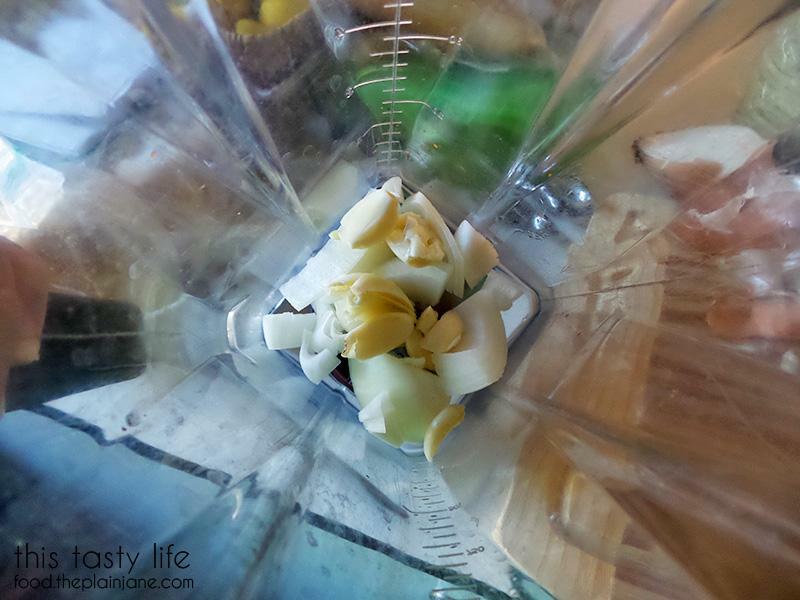 In a blender, add your onion and garlic and pulse together until chopped. Add in your cilantro and pulse again until it's blended. Add in mayo and sour cream plus salt and pepper to taste. Pulse at high speed until you get a smooth green sauce. Pour into a squeeze bottle and keep in the fridge. 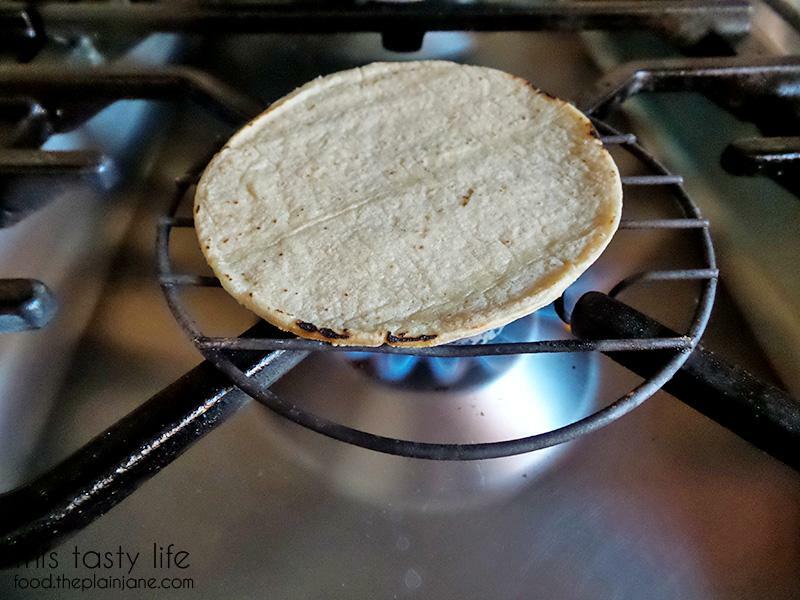 Warm up a few tortillas and keep in them in a towel until you're ready for them! Get a non-stick pan and put it over medium-high heat. Let the pan heat up for a few minutes until it is quite hot. Add a pile of shredded cheese into the middle of the pan. It will start to spread out on its own as it melts. Once the cheese is about halfway melted, add in a small pile of chicken on top of the cheese. The edges of the cheese will start to turn golden brown. Once it looks like a crust is forming, take a spatula and carefully lift up the cheese. If it lifts up together then it's ready to turn over. Flip one side of the cheese over like you're making an omelette. Remove from pan and add on top of a warm tortilla. Repeat until you have enough tacos to feed you and your family! Top with slices of avocado and cilantro garlic sauce. Garnish with cilantro leaves. This recipe was created for the Del Real Blogger Recipe Challenge. Del Real provided complimentary products for use in the recipes. Your questacos look delicious Mary! I need to make that sauce and put it on everything! That last photo is a ringing endorsement of why I have to try this recipe! Thanks, CC! This recipe is pretty easy and that cilantro garlic sauce is KILLER. I put it on a lot of stuff and it’s so tasty! If you really really like garlic then use 4 cloves, otherwise cut it down. I thought it was almost too strong but then I ended up really liking the extra garlic flavor. I think I’ll play it safe with the garlic cloves but I do plan to make it this weekend.